It is important for you to choose the right water feature and installation contractor in order to have long term satisfaction with your investment. Our company can offer you many different types of structures, in all sorts of shapes and sizes. Our customers in the Ann Arbor area have been thrilled with our work for decades and we are always looking for new opportunities to do more of this work. Give us a call today or request a quote online and one of our dedicated team members will reach out to you with more information. in both the design and implementation of our privacy wall/water feature. We are very pleased with the final results." and did a great job cleaning up!" He was friendly and punctual told us how everything would work and the job his team did was perfect! I would refer Todd's to anyone who needed landscaping." ★★★★★ - Andrew, Pittsfield Twp. and did the work they said they would." with adding the additional stamped concrete, rocks and sealing of the old stamped concrete. It makes the back yard look wonderful." 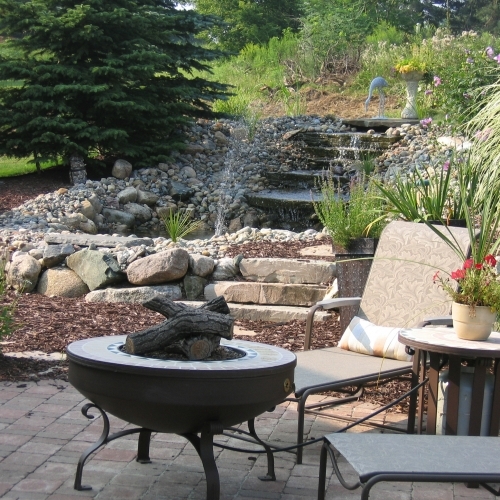 This is the second time we used Todd's Services for landscaping work and are very pleased with the end result. Everyone from Tom(our Sales Person) to the Landscaping Crew were very professional and pleasant to work with. They truly understand customer service. We would highly recommend Todd's Services! Thanks everyone that worked on our landscaping project - GREAT JOB!"